William Blake was a radical in countless ways: political, religious, personal. He dared to confront and question received knowledge and forced his readers then and now to ask questions about the nature of God, the Universe and everything in it. 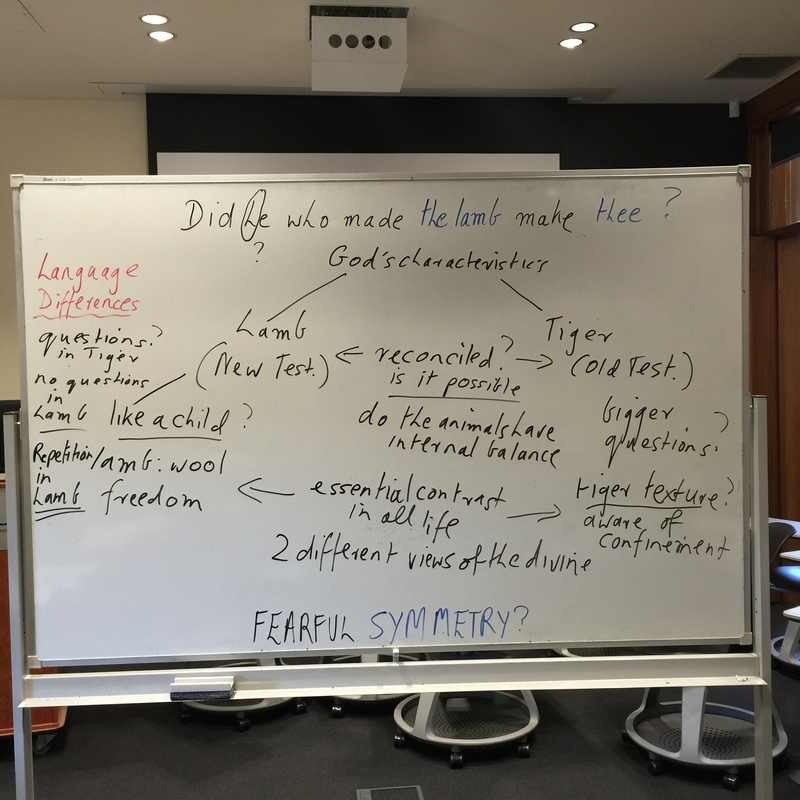 Among many aspects of his creative life we explored closely today this contrasting vision of the Lamb and the Tyger in his Songs of Innocence and Experience. 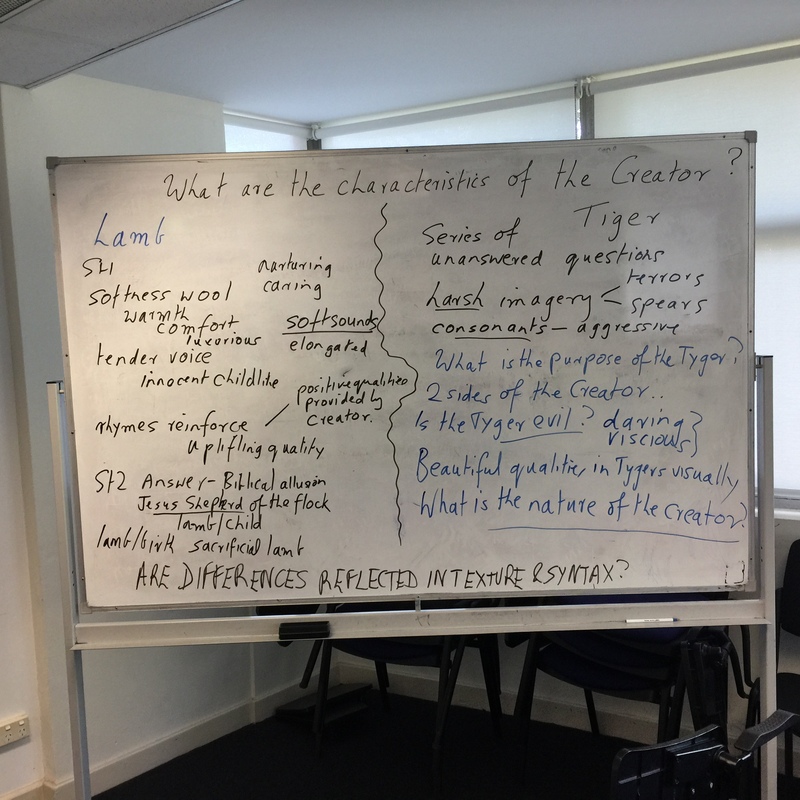 We brain-stormed to expose some of the core differences between these two aspects of creation and how these differences might illuminate Blake’s complex vision of the multi-faceted nature of the creator. We will see some of these differences again when we turn attention to The Marriage of Heaven and Hell and Blake’s illustrations to The Book of Job. Here are some of the fruits of our inconclusive brain-storming; as was said by Peter Ackroyd in Singing for England, Blake’s poems have layers and layers of meaning that are never exhausted. Creative: 1/ Take a single line from any one Blake poem that you have read this week and use this as the basis for a poem of your own. Where possible try to imitate what you understand of Blake’s style of writing. 2/ Write to William Blake asking him what he means in “The Tyger”. Tell him which parts of the poem you have particular difficulty with. Critical: 3/ Summarize the ideas presented on both white boards above and show how these brain-storming sessions have shed some light on Blake’s complex ideas. 4/ Find out what you can about Kathleen Raine (She was second speaker in the Blake film Singing for England. Why is she so important and controversial in her study of William Blake? Create a blog topic of your own utilising some of the input you have had from this week’s lecture and tutorial. ← Mistah Kurtz- he dead.